WOULD YOU TAKE a fiver from a stranger? It seems that for the Irish, the answer is frequently a surprising ‘No, thanks’ – but maybe that will change today, when a global initiative called (you guessed it) Free Money Day takes place. 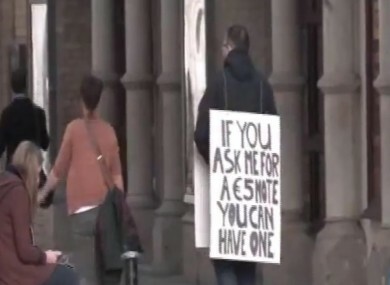 Last year, cashback company Fat Cheese tried to give away fivers on Free Money Day, sending a man out with a sandwich board advertising the fact that if you asked him for a fiver, he’d be only too delighted to hand one over. If you ask me for a €5 note, you can have one. In all, 1,400 people passed by – 200 people took money but 1,200 barely gave him a second glance. But will things change this year? Free Money Day is an event where people are invited to hand out their own money to complete strangers, asking the recipients to pass half on to someone else. You’re asked to pass on two notes or coins at one time. The organisers say the aim is to “raise awarenesss and start conversations about the benefits of economies based on sharing”. But that’s not all – it also aims to offer a “liberating experience to inspire more critical and creative thinking about our relationships with money”. For some though, it’s a good way of getting their paws on some cold, hard cash. Nineteen countries took part in the event last year, and the people behind the day, the Post Growth Institute, say they hope to have more participants in 2012. Would you take part in Free Money Day? Email “Would you take free money from a stranger?”. Feedback on “Would you take free money from a stranger?”.